this week’s penny black saturday challenge is ‘for the guys.’ the image is watercoloured, die cut and attached to a crumpled and sanded die cut piece of paper. i distressed the edges of the dotted layer and i had to add stickles somewhere, so they’re on the dots of the gift and the flower centres. i’m also submitting this to the simon says stamp and show your distressed/torn edges. thanks for popping by. Very cute. It would make a nice birthday card or a random card to brighten someone’s day. This is just too cute! 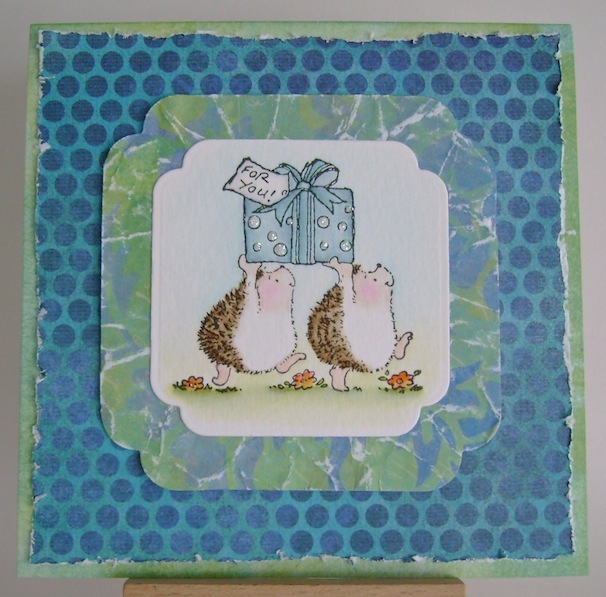 I love blue and green together and you know I love those hedgies :) The stickles on the wrapping paper is perfect.